UNP proposal to remove Pujith! 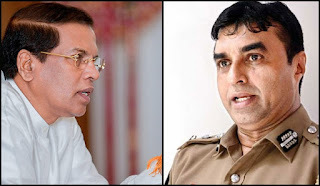 With a majority of MPs in the UNP wanting Pujith Jayasundara removed as the IGP, MP Hesha Withanage says he will move a proposal at the party’s parliamentary group meeting for his removal. Withanage said the government has been criticized over Jayasuriya’s recent conduct and over the enforcement of the law and the curbing of the underworld. Meanwhile, reports reaching Sri Lanka Mirror say the president is considering removing the IGP. There is a proposal to move a motion to parliament for his removal. A decision in this regard is expected once the president returns from New York where he is to attend the 73rd general assembly of the United Nations.